First of all, we need to know the structure of the universe. All kinds of matter and energy are included in the closed cycle process from generation to renewable power and restart the cycle, but there are necessary eons eons old. The universe as a sphere veskonačne size, is filled with nepokretmom drug, we can call the ether. He will remain unknown to science in all characteristics, until you accept the existence of spiritual entities of the universe (ACU). ACU affects the ether, performing the same vibration with very high frequencies, where the strings are formed in three spatial directions, and in the cross-section is formed in the form of quark matter. which are together because gluons that bind them. This initial process of forming quark gluon plasma that forms Gravatar, quasars, neutron stars and supernovae, exploding and in further thermodynamic processes produce subatomic elements, atoms molecules, gases, clouds of gas, heavenly bodies of various sizes and shapes. In the formation of matter (quarks and gluons), formed space for the movement of materials and time as a measure of the movement and tracking the matter. Then form and gravity, which has the task of gathering the material in piles mass until it reaches the critical mass and critical gravity in a certain area. Then form a black hole where the material returns to its original shape, the air from which it is derived. In a black hole, does not exist, nor the government any law related to the matter. There SEU, as a basic matter of returning the router on the air and thus closes the circle of appearance and disappearance of matter. Black holes are the place of "dying" of matter, or by laws similar to those that occur in the formation of matter (chord sections). Any other understanding of the universe are just illusions with the researchers, whose consciousness is under the command of mind that does not allow to find out the true causes of the phenomenon in general. This is my vision of the universe, and perhaps true basis for a new theory of the origin of material and energy of the universe of entities (MEEU). 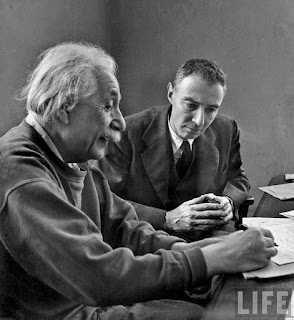 Maybe not Oppenheimer, but Einstein always had “fundamentalitis”. I think the downturn in productivity of the elders is mostly attributed to the following factors: the slowdown of normal aging, accumulation of chores and responsibilities, and also that they work on harder problems. 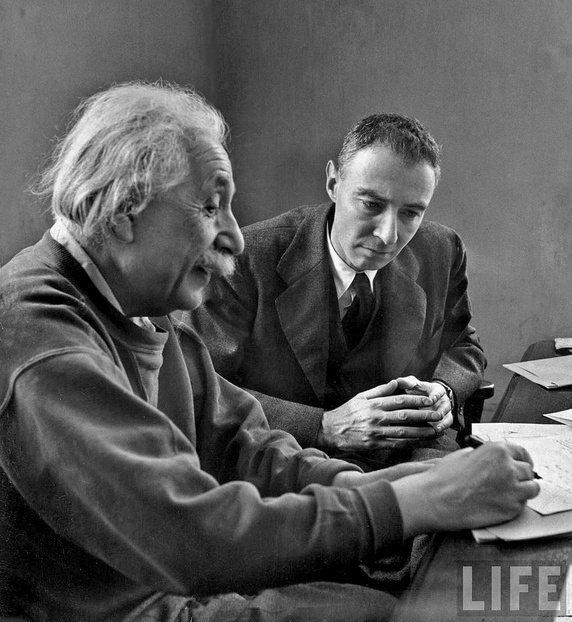 There is no doubt that both Einstein and Oppenheimer accumulated a disproportionate share of responsibilities. This seems to have been their motivation for the IAS - to escape the activity that bogged them down so they could work on hard problems. In the case of Einstein, I think the standard trope that he wasted his time looking for a unified theory and rejected QM is simply a false romantic claim. He may have been wrong about some details (being wrong is allowed), but it was incoherent interpretation that he rejected, not QM. After all, the problems he was addressing, i.e., quantum foundations and quantum gravity are still ongoing.